It's looking increasingly like Senate Majority Leader Mitch McConnell (R-Ky.) won't restore much of the steep Medicaid funding cuts in Take Two of his health-care bill, which he'll roll out today. That didn't stop the leaders of six top doctors' associations from making a last-ditch plea on Capitol Hill yesterday to convince Republicans to oppose it. At 9:15 a.m., the group met with Sen. Tom Cotton (R-Ark. ), then Steve Daines (R-Mont.) at 10 am., staff of Marco Rubio (R-Fla.) at 10:45 a.m. and Jerry Moran (R-Kan.) at 11:30 a.m. A quick noon break for lunch at the Dirksen Cafeteria, and then they were off to meetings with GOP Sens. John McCain (Ariz.), John Boozman (Ark. ), Cory Gardner (Colo.), Rob Portman (Ohio) and Johnny Isakson (Ga.) in the afternoon. The group included presidents of the American Academy of Family Physicians, the American Academy of Pediatrics, the American Congress of Obstetricians and Gynecologists, the American College of Physicians, the American Osteopathic Association and the American Psychiatric Association. Together, the associations represent half a million doctors in the United States who deliver primary care for kids and their parents. Unlike previous efforts to change the U.S. health-care sytem, neither drug companies nor care providers have played a significant role in crafting the GOP push to overhaul Obamacare. Indeed, most of the Senate bill has been written behind closed doors, as I've written, with even key Republican senators lacking knowledge about what's in various drafts. But that doesn't mean that outside stakeholders haven't done what they could to let their views be known. The providers' push started last November, when then-candidate Donald Trump's win opened a window for Republicans to repeal the Affordable Care Act and the groups banded together as one unit to protect the ACA's coverage expansions. At a November meeting of the American Medical Association, the presidents of these groups asked their staff to start plotting. “We had our first meeting in early December and kind of started mapping through the strategy,” AAFP lobbyist Shawn Martin told me. Since then, the groups have visited Capitol Hill five times to urge House and Senate Republicans not to enact legislation that would overhaul the ACA and dramatically reverse its coverage gains. They don’t think the present law is perfect by any means, but they’re deeply worried about the Senate health-care bill’s deep Medicaid cuts -- that is, what that would mean for the ability of low-income families to receive care – and how the bill provides a pathway for states to opt out of its mandatory essential health benefits. “We’re talking about something that is going to devastate our patients,” AAFP President John Meigs told The Health 202 yesterday. --Meigs and his colleagues said they didn’t meet with McConnell or anybody on his leadership team -- which has been holding their own heart-to-hearts with moderate senators, trying to convince them to vote for the bill even with the Medicaid cuts intact. Here's what McConnell has told several hesitant senators (including Portman and Sen. Shelley Moore Capito (R-W.Va.): The bill’s deepest Medicaid cuts are far into the future, and they’ll never go into effect anyway. Under the current version of the Senate health-care bill, federal Medicaid spending would drop by 26 percent starting in 2026, pegged to the Urban Consumer Price Index. That's still eight-and-a-half years away -- long past senators' next election. And cutting Medicaid is so unpopular, with so much resistance from the health-care industry, that it's likely Congress would find a way to avoid the cuts when the time comes. After all, that's what Congress did for years by enacting the so-called "Doc Fix" to a Medicare doctors' payment formula. But that's a big "if" in the minds of medical providers, who fear having any Medicaid cuts written into law. The doctors told me they didn't get any solid promises from the rank-and-file yesterday to oppose the GOP bill. But the senators they met with generally listened and indicated they at least understood their concerns, said Jack Ende, president of the American College of Physicians. But the doctors also said they were dismayed at some of the things they heard from GOP staffers. One staffer insisted the Senate bill wouldn’t lead to cuts to Medicaid or insurance benefits -- even though its federal spending cuts would almost certainly mean that states would roll back their own programs, opening the door to opting insurers out of coverage requirements. “With some of the aides there were talking points someone created somewhere that really don’t fit what went into the bill,” said Colleen Kraft, president-elect of the American Academy of Pediatrics. The doctors say dispelling the myths with truth is where their power lies. Toward that end, the associations have also invested in advocacy over the last few months, sending letters to Republicans lawmakers and urging their own members to show up at town hall meetings. The AAP has had more than 30 op-eds and letters to the editor opposing the Republican health-care bills published in newspapers around the country. The group has also encouraged pediatricians to tape themselves explaining why the GOP bills would be bad for patients, and regularly featured those videos on its Twitter feed. AOA President Boyd Buser said his association has been sending out email blasts to members and providing them with sample letters to send to members of Congress. Pediatricians joined Sen. Tim Kaine (D-Va.) at a roundtable on Monday at Northern Virginia Community College to discuss the effects of repealing Obamacare. And doctors are far from the only ones agitating against the GOP health-care bills, my colleague Juliet Eilperin and I report. "Most corners of the U.S. health-care industry have stood steadfastly opposed for months to Republican efforts to revise the Affordable Care Act...in recent weeks, a last gasp of advocacy has come from an even wider range of groups and individuals trying to block the Senate health bill," she writes. "Community hospitals have held information sessions...Patient associations have flown in hundreds of Americans with chronic illnesses to meet with lawmakers and their aides." It’s still unclear whether the opposition efforts will pay off, as McConnell presses toward a vote on the legislation next week. But the fact that the process has dragged out for so long, with so many Republicans waffling on the legislation, could be partly due to pushback from the medical community. President Trump promised to repeal Obamacare his first day in office. Five months later, it’s still deeply uncertain whether Republicans will even be able to send him a bill at all. AHH: This is a big deal. An FDA panel has endorsed a first-of-its kind cancer treatment that uses patients' own immune cells to fight the disease. The unanimous recommendation means the agency could approve the new treatment by the end of September, forging an exciting new path in the immunotherapy frontier. The panel concluded that the therapy's benefits for desperately ill children far outweigh its potentially dangerous side effects.The Post's Laurie McGinley reports. "Novartis, the drugmaker behind the CAR T-cell therapy, is seeking approval to use it for children and young adults whose leukemia doesn't respond to traditional treatments — a group that numbers 600 or so patients a year in this country...If cleared by the FDA, it would be the first gene therapy approved in the United States," Laurie writes. "But unlike traditional gene therapy, the new treatment doesn't replace disease-causing genes with healthy ones. Instead, it uses technology to reprogram immune cells called T cells to target and attack malignancies." OOF: Health insurers have been pretty circumspect about the Senate health-care bill overall, but they're coming out of the woodwork to oppose an amendment offered by Sens. Ted Cruz and Mike Lee, saying it would destabilize the individual market where millions of people without employer-sponsored coverage buy their plans, The Post's Carolyn Y. Johnson writes. The Cruz/Lee amendment, called the “consumer freedom amendment,” would allow insurance companies to sell cheap health plans that don't meet the ACA's coverage requirements as long as insurers also agree to sell a plan that does. The idea is that healthy people would be able to buy only the coverage they want. But health insurers are warning that would destabilize the insurance marketplaces, cause premiums to rise unsustainably for people with chronic health conditions and leave fewer and fewer insurers selling plans — all the hallmarks of a death spiral. “I'm writing to make clear my view on how the 'Consumer Freedom Option' is unworkable as it would undermine preexisting condition protections, increase premiums and destabilize the market,” Scott Serota, president of BlueCross BlueShield Association, wrote to Cruz and Lee. 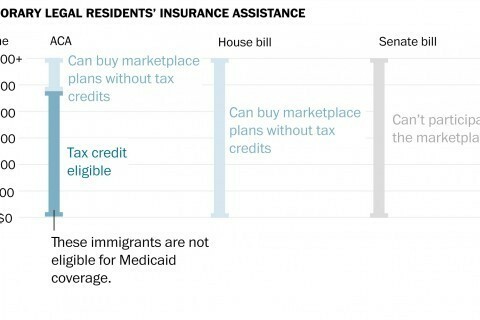 In a document circulating on the Hill, the trade group America's Health Insurance Plans predicted that the generous exchange plans that were compliant with coverage requirements would become a de facto high-risk pool, with higher premiums that would mean mostly sick people would want to enroll. More people would drop out as premiums rose, leaving all but the sickest buying insurance, which would push premiums even higher. OUCH: The White House says the Congressional Budget Office is unreliable. But one thing is definitely unreliable: Its ability to spell English words. A White House video lashing out at the CBO misspelled the word "inaccurately," prompting amusement around the Twittersphere. The point of the video was to argue that the CBO's predictions that the GOP health-care bill would result in 22 million fewer insured Americans can't be trusted. The video escalates a developing conflict between the CBO, which is a nonpartisan body, and the Republican Party over the basic mathematics underlying the GOP effort to undo the ACA, The Post's Max Ehrenfreund writes. "Political criticism of the CBO has long been part of the debate in Washington, but the White House's post on Twitter — which resembles a digital advertisement for a political campaign — suggests a broader, concerted effort to sway public opinion against the agency," Max writes. "Independent analysts say that while the CBO is sometimes mistaken, the agency's analyses do not betray any partisan bias, and that any effort to forecast the effects of complex legislation that affects one of the economy's most important sectors is inherently prone to error." Mick Mulvaney, Trump's budget director, said in May that the CBO analysts were working on behalf of Democrats. But even some conservative experts feel Mulvaney went too far. Michael Strain, an economist at the right-leaning American Enterprise Institute, said his comments were “really inappropriate, and frankly absurd” in an interview with The Post last month. As McConnell rolls out a revised version of the bill this morning, conservatives are worried it would not undo the ACA aggressively enough, my colleagues Kelsey Snell, Sean Sullivan and John Wagner report. "Those worries, alongside lingering anxiety among centrist Republicans that the bill is going too far, threatened to leave the rebooted effort short of the votes it will need to pass next week, when McConnell hopes to bring it to a vote. He can only afford two Republican defections," they write. --It's hard to imagine Paul would vote for any iteration of the health-care measure. He blasted it in a Breitbart op-ed yesterday, writing that "too many Republicans are falling all over themselves to stuff hundreds of billions of taxpayers’ dollars into a bill that doesn’t repeal Obamacare and feeds Big Insurance a huge bailout." "The Senate Obamacare bill does not repeal Obamacare. Not even close," Paul wrote. "In fact, the Senate GOP bill codifies and likely expands many aspects of Obamacare." --As the negotiations continued on Capitol Hill, Vice President Mike Pence visited Paul's home state of Kentucky, one of the states with the most at stake under the Senate bill. Pence joined Republican Gov. Matt Bevin in Lexington for a meeting with Kentuckians who say they have been hurt by the ACA. In a campaign-style speech at a small business, Pence said the revised health-care bill adheres to conservative principles that would deliver more affordable health care with greater choices for consumers, the AP reports. “I came here today to turn up the heat, because this is the moment,” Pence said. “Now is the time. It’s time for Congress to step up and repeal and replace Obamacare.” Pence also predicted that the Republican repeal-and-replace effort will succeed this summer. Rep. Steve King (R-Iowa) said he wants to take money from Planned Parenthood and food stamps to pay for President Trump's proposed Mexico border wall. King said on CNN he supports the $1.6 billion in funding that the House is considering as a start for building the wall -- but he'd love to add another $5 billion by cutting into Planned Parenthood's Medicaid reimbursements. "I would find half of a billion dollars of that right out of Planned Parenthood's budget," King said. "And the rest of it could come out of food stamps and the entitlements that are being spread out for people that haven't worked in three generations...We've got to put America back to work, this administration will do it." Senate Republicans have won an argument before the parliamentarian that will allow a House-passed health care reconciliation bill to be taken up and amended in the Senate next week without any obstacle, CQ has learned. Defenders say it prevents “medical tourism” that destabilizes the marketplace. Opponents say it's just another instance of anti-immigrant sentiment. Some small businesses buy their health plans through trade associations. The GOP health bills would make those cheaper. But that could also make employer-based insurance more expensive for others. The Georgia program that Brenda Fitzgerald led makes little mention of the problems with sugary soft drinks, putting her at odds with research and many health experts. 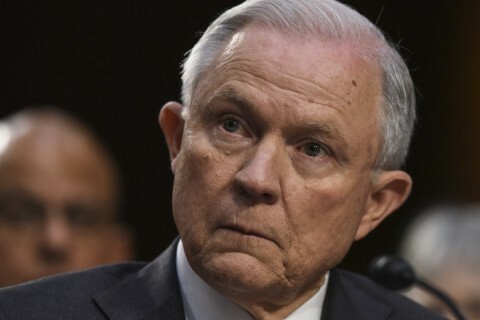 Attorney General Jeff Sessions is poised to announce a major law enforcement action this week targeting health-care fraud, focusing on opioid treatment programs exploiting Obamacare insurance plans, according to two people familiar with the matter. 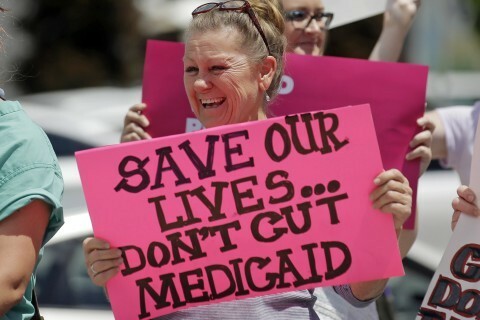 A closer look at a notion embraced by conservatives, who are backing big changes to Medicaid. The Hill is hosting an event on "The Cost of Caring: Family Caregivers and Tax Reform," featuring Sen. Tammy Baldwin (D-Wis.), Sen. Joni Ernst (R-Iowa), Rep. Dan Donovan (R-N.Y.) and Rep. Michelle Lujan Grisham (D-N.M.). The American Enterprise Institute is holding an event on Friday on Medicare in the Trump era. Stephen Colbert talks to John Oliver about Don Jr.